CAMARILLO, Calif.. Feb. 4, 2019 — Semtech Corporation (Nasdaq: SMTC), a leading supplier of high performance analog and mixed signal semiconductors and advanced algorithms, will be displaying its Software Defined Video Over Ethernet (SDVoE™) compatible solutions at Integrated Systems Europe in Amsterdam from Feb. 5-8, 2019. Demonstrations of Semtech’s BlueRiver technology for SDVoE will be featured at the SDVoE Alliance™ stand at 3-B150 and showcased in over a dozen member booths at the show. Software Defined Video Over Ethernet network architectures are based on off-the-shelf Ethernet switches providing substantial cost savings, greater system flexibility and enhanced scalability over traditional circuit-based AV matrix switching solution. 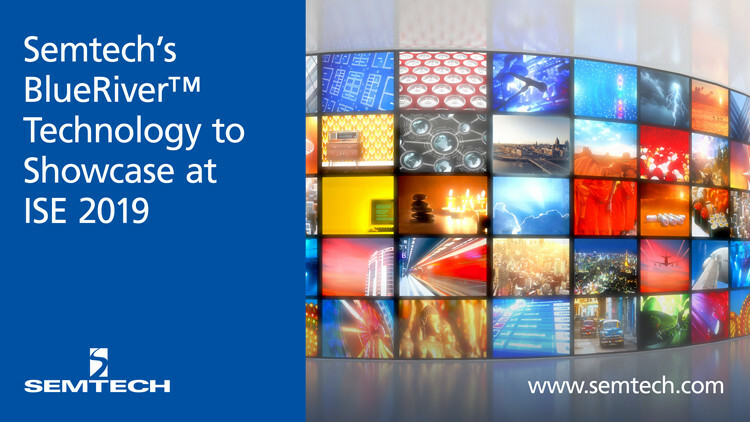 Semtech’s BlueRiver platform is at the heart of SDVoE-based technology powering over 150 interoperable products, many of which will be on display at ISE. To date, SDVoE-based products have been deployed across a wide range of profession audio/visual (Pro AV) vertical markets, including corporate, industrial, medical, residential, education, signage, hospitality, and entertainment. Semtech’s BlueRiver solutions are one of the industry’s first chipsets that are able to transport uncompressed, zero-latency Ultra HD/4K HDR over standard Ethernet. The BlueRiver platform consists of NT1000 and NT2000 AV-over-IP chipsets and a comprehensive software Application Programming Interface (API). The SDVoE Alliance is a non-profit ecosystem of more than 40-member technology providers. The organization collaborates to standardize the adoption of Ethernet to transport AV signals in professional AV environments. The SDVoE Alliance will be sponsoring a variety of in-depth educational sessions at ISE. A full description of topics and registration is available at https://sdvoe.org/events/ise-2019-training-schedule. Semtech’s BlueRiver™ platform, brings the disruptive power of Ethernet to AV signal distribution, forever changing the dynamics of the Pro AV industry by allowing installers and OEMs to replace proprietary AV matrix switches with off-the-shelf Ethernet networks that deliver dramatically better price/performance, flexibility and scalability. The BlueRiver platform delivers a single programmable system on chip (SoC), which can be used to replace traditional AV/KVM extenders, matrix switchers, videowall controllers and windowing processors with a simple network of transmitters, receivers and off-the-shelf Ethernet switches. BlueRiver chipsets are the foundation of SDVoE technology, offering zero-latency, uncompressed 4K streaming over standard Ethernet with unique support for HDMI 2.0a and HDR. They also integrate high-fidelity video scaling, windowing and audio downmixing. For more information, visit www.semtech.com/products/professional-av/blueriver. All statements contained herein that are not statements of historical fact, including statements that use the words “will,” “would benefit,” “designed to” or other similar words or expressions, that describe Semtech Corporation’s or its management’s future plans, objectives or goals are “forward-looking statements” and are made pursuant to the Safe-Harbor provisions of the Private Securities Litigation Reform Act of 1995, as amended. Such forward-looking statements involve known and unknown risks, uncertainties and other factors that could cause the actual results of Semtech Corporation to be materially different from the historical results and/or from any future results or outcomes expressed or implied by such forward-looking statements. Such factors are further addressed in Semtech Corporation’s annual and quarterly reports, and in other documents or reports, filed with the Securities and Exchange Commission (www.sec.gov) including, without limitation, information under the captions “Management’s Discussion and Analysis of Financial Condition and Results of Operations” and “Risk Factors.” Semtech Corporation assumes no obligation to update any forward-looking statements in order to reflect events or circumstances that may arise after the date of this release, except as required by law.